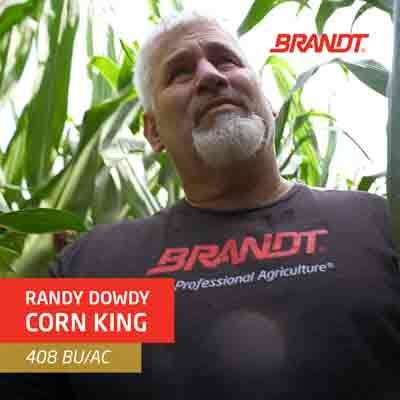 BRANDT's proprietary foliar nutrients have helped Randy Dowdy, soybean world record holder, win the Corn Warriors' yield challenge on corn. The first generation Georgia grower is the new "Corn King," winning Corn Warriors' Season 2 with 408 bu/ac using BRANDT foliar products. Airing on RFD-TV, Corn Warriors follows five champion corn growers as they compete to produce the highest corn yield. Dowdy beat a stacked field of high-yield contest winners, including world recorder holder David Hula. Dowdy has used BRANDT's high performance nutrients since 2014, citing them as a key part of his fertility program. The products Dowdy uses include BRANDT's Smart System line of high efficiency foliar nutrients and BRANDT's new enzyme-based technology, BRANDT EnzUp. BRANDT's proprietary chemistries maximize nutrient uptake and in-plant mobility to improve plant health and productivity. "When I began using BRANDT Smart System, I saw a strong visual response and knew I needed to take a close look at tissue tests to see what was happening inside the plant," said Dowdy "I would pull tissue samples before and after application. After applying BRANDT foliars, there was always a fast and substantial spike in nutrient levels, which told me that my applications were getting into the plant and doing their job to adjust plant nutrient levels. These products give me the tools to manage nutrient levels precisely and quickly to optimize plant health." "Congratulations to Randy on winning Corn Warriors! This is awesome," said Rick Brandt, BRANDT President and CEO. "We're very proud of the nutrient technologies we've developed and thrilled to see growers around the world experiencing great results." BRANDT and Dowdy are joining forces at the 2019 Commodity Classic (booth #2961). BRANDT is also partnering with Dowdy and Hula in their Next Level farm camps, where growers can learn the secrets to growing high yield corn and soybeans. At Commodity Classic, BRANDT will share information on the new BRANDT EnzUp enzyme technology at the CC What's New Session March 2, 2019 at 2:30pm in West Concourse, Room W206B.